Upon it’s release The Legend of Zelda: Ocarina of Time was dubbed by the gaming industry as the greatest computer game ever made. It was one of those gaming landmarks that only comes around one or two times in every console generation. Previous to this the Zelda games was already one of the most respected franchises in the gaming world with titles such as Link’s Awakening and A Link to The Past made giant steps for Nintendo. It took nearly five years to make and has been making waves ever since. It’s strange. On one hand, this game took the Zelda series to 3D and introduced a lot of new concepts, including the songs we saw in a number of subsequent games. On the other hand, this game really sticks to the old concepts and feels like it fits in, just with a more flexible camera. It’s changed far less than, say, Mario‘s transition to 3D. I guess that’s because in the previous Zelda games you still moved in what could be thought of as three dimensions whereas Mario was classically a side-scroller. Therefore Mario needed a far larger overhaul when it was brought to the Nintendo 64 compared with what Legend of Zelda required. In a sense true, but also in basic gameplay the game stays more true to its roots. 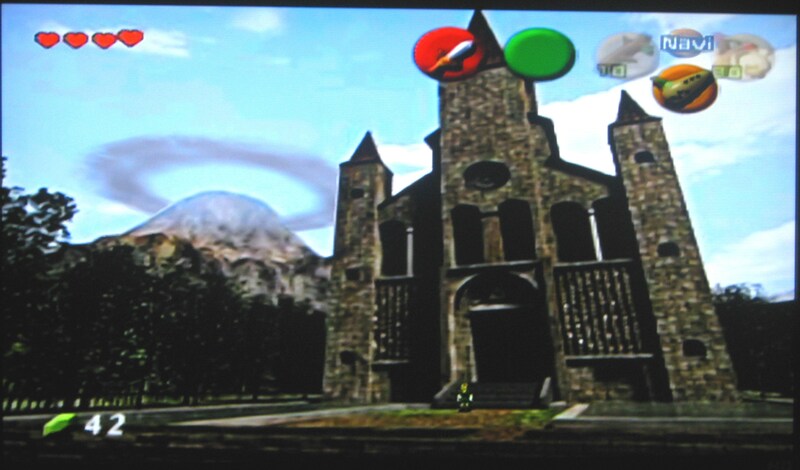 While in Mario, you went from a level-based structure, one after the other, to the mission-based structure of Super Mario 64, The Legend of Zelda: Ocarina of Time works the same as the similar games, exploring the world that gets progressively unlocked. Why mess with a formula that’s proven to work well? I mean Link’s Awakening pre-dated Ocarina of Time and is arguably their best outing on a handheld. Oh, it’s absolutely a good move and I’m glad they did it – the series does make the transition to 3D very well – but I still find the contrast between the two series interesting, and it rarely happens that a series makes the transitions while staying this close to the original. With the exception of fighting and sports games I know what you mean. In a way they were able to change the game from being purely dungeon based to being based a lot around the sweeping scenery. I remember my first venture into Hyrule Field many years ago, I was truly taken aback. Mario became cartoony platform 3D fun, Zelda became breathtakingly cinematic. Absolutely, and while it felt part of that was already present, it integrated beautifully. It’s certainly not a 2D game made to be 3D, it makes the best use of it that it can; including plenty of puzzles making use of the 3D setting, from having to get around fences to crawling through small holes, and jumping down holes with precise aiming. It also works with the stealth missions… which ranks as one of the most frustrating mini-games introduced to this long running series. Something we also touched on in our Majora’s Mask discussion. I understand that it breaks up gameplay but it feels unnecessary. That’s the main reason it’s in there, another reason to get through the game rather than constantly battling. But they’re simultaneously more frustrating than a dedicated stealth game like Metal Gear Solid, and simpler with less options to get through there. It makes good use of the time features since the guards have their own schedules more or less and it is easier to sneak around when it is night-time. Always a helpful, and something you’d expect. Not that you can just change the time around until you get through the first stealth part. I always did enjoy the use of the songs in the game to unlock new features or to further the plot line. Something I guess I missed a little bit in Twilight Princess (where, if I remember correctly, they generally abandoned the use of magical music altogether). It could be, that’s of course one of the games I haven’t played yet. Even the camera angles (something we have majorly quibbled about with its contemporaries) are well executed. That’s possibly the biggest compliment we can give here – we didn’t really have any trouble with the camera, so we had no reason to complain about it. And that’s the way that should be. Now, we played the Gamecube port (available with the first release of The Wind Waker), so I’m not sure whether the graphics were upgraded there, but it felt not – they feel less detailed than Majora’s Mask, but at the same time the simplicity seems to have allowed for larger, more integrated areas of the world, making the game seem smoother and larger. I disagree completely. Granted the time constraint in Majora’s Mask mean less exploration was available but it was by far a larger and lusher world when compared to Ocarina of Time. Yeah, that’s true. My point is not that Ocarina of Time’s is larger, it’s that Majora’s Mask world is divided in more smaller areas (such as the main town having small sections), where Ocarina of Time’s are larger and more joined together – I get the feeling Ocarina of Time’s first town has one area the size of three sections of Majora’s Mask’s. I guess that was helped by the restricted AI and graphics lent to the NPCs. It was interesting that in Link’s hometown you could see their fairy counterparts before the NPC themselves. I guess it saved a lot of loading time. Yeah, that’s one other odd thing that makes sense from that point of view – the characters themselves weren’t shown until you were quite close. It saved loading time… and probably allowed them to be more impressive elsewhere. Then they were able to improve this with Majora’s Mask by creating the large world outside of the city which leads to all the areas with randomly generating enemies as well as other Hyrulian style paraphernalia. It’s pretty apt that these two games are usually compared to one another because there is such a kinship between the two (with Majora’s Mask being a direct sequel) but I guess that in terms of features I alway felt Majora to have the edge. Even if the three-day time limit can be brutal. Absolutely true, the three day limit is… somewhat annoying, but as the sequel, it’s clearly better in nearly every way. Considering the 3D action/adventure was still very much in it’s infancy as Ocarina of Time burst onto the scene it is easy to see how it was dubbed by many as the greatest game ever released. There was nothing out there quite like it and it played a lot like your own personal fantasy movie. Even if the graphics have dated immensely the fundamentals still play like an absolute dream. This is the penultimate game from the first batch of Kat’s games meaning that, as we decided after finishing our write-up, we will be targeting more obscure games (granted Quadradius and Drop7 are fairly unknown but that’s by the by) as well as some interesting looking arcade games like Lunar Lander. Personally I am really hoping that we get to Second Sight and The Logical Journey of the Zoombinis pretty soon as they have been resting in our to do pile since early December. Thanks for this review. I absolutely loved the game and loved playing until the end. Aaah, Navi, Zelda and Gannondorf. The good old times. Never played Majora’s mask but I did play Windwaker which came pretty close in originality to this game.